Saturday, May 25, 11 a.m. Please fill out the Commencement RSVP form to let us know how many of your family and friends will attend. If plans change, you can use the form again to update us. We will need a final tally by Monday, May 13, so that we can plan for meals, seating, and other event needs. If you wish to attend graduation please be on campus before 11 am. Dorms will be locked and room cleaning is strictly prohibited during graduation. 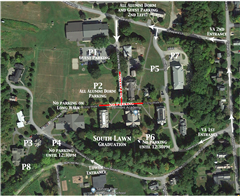 All traffic entering campus by Main St from the south, please take the first right onto Pleasant St, and proceed to the second left hand turn into Vermont Academy following parking to Jones Dorm, P5 and P7, Alumni Dormitory, P2, and guest parking P1. All traffic entering campus by Main St from the south can take the second right from Main St. onto Academy Ave and look for parking either at the end of the street near Campbell and Buchanan Dorm, or take a left onto Burke Hill Rd. and proceed to park on the side of the road. Cars on this road will have easiest access to parking in P4, P8, and P3, at the end of graduation for moving out of dorms. All cars coming to campus after 12:30 should proceed to designated parking lots for the dorms where their students reside. Below is a list of parking spaces with the easiest access to dorms. There is NO PARKING ON LONGWALK, at any time during moving. We will need this road so that cars can enter and exit campus in a controlled manner. Train and bus service is available to the town of Bellows Falls, Vermont, approximately five miles from the school. The information list is provided as a convenience only. Vermont Academy neither endorses nor is being compensated by the businesses listed on this page. Southern Vermont is known for arts venues, artisans and craftspeople, shops and restaurants, and outdoor recreation opportunities in all seasons. The state of Vermont provides these resources for the southern region of the Green Mountain State. Brattleboro is an arts town, a farmers' market town, a restaurant town, and a cow parade town. Keene features theaters, restaurants, cafes, and shopping centers.